Metal Polishing How to restore, maintain and preserve all types of metals and metallic coatings. So I was looking at getting into the Flex line of polishers after I got the hang of the machine I have and getting a good technique down with results before I drop decent money on my next upgrade. I like to see what other offerings a tool company might have in other industries and I feel it is a good indicator to quality and confidence of their brand. I came across this bad boy and was amazed at some of the YouTube videos of this thing working. I would love to see what this can do with the Marine 31 polish. How about a video of you using it on your boat? Well, I don't have one myself, however here is a video of it being used on a boat. Just watched it and that's a great use of a tool meant for sanding. The tool Fein not Flex. Flex makes a lot of tools for other industries but this was not a Flex tool. Stainless is really hard so removing scratches out of stainless normally requires special abrasives our rouges that are different than how aluminum polishes are made. I don't know what the differences are I just know that working on stainless steel is an art unto itself. I've had good luck using rotary buffers and DA Polishers to restore stained and oxidized stainless steel. Removing scratches would require a lot more aggressive products as well as follow-up steps to get back to a mirror finish. The thing about stainless is its use is limited to railing and brightwork so the percentage of surfaces to work on overall are quite small as compared to buffing out the boat hull. 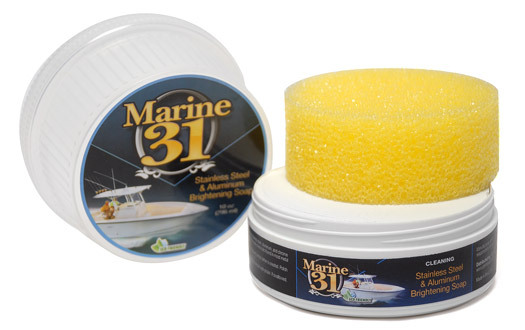 I think there will be more do-it-yourselfers willing to buff out a boat hull than to purchase the specialty tools and products for buffing out stainless. If a person wants to keep it simple our Stainless Steel & Aluminum Brightening Soap is super easy to use and doesn't require any special tools outside the human hand. It's possible the guy in the video was calling his Flex tool a Fein, I'd have to re-watch to find out. Fein also makes something similar called the Fein Surface Polisher. Looks like they both do the same type of thing. Yes there is a difference in the name. However Fein is a superior tool company compared to whomever makes Flex. It is the same animal however. I wouldn't invest in a tool like this unless I had a real reason or the income generated from it would make a difference. But I thought it was a hell of a tool and wanted to share. However Fein is a superior tool company compared to whomever makes Flex. Flex makes Flex. I know. I've toured their manufacturing plant and I'm the first person they ever let take pictures inside the plant and share with the public. And in my opinion they make GREAT tools.